I was going to blog about the Spicy Cheese-E Quinoa Pasta Bake I did tonight but I thought it made more sense to tell you about two products I have been tinkering with, first! Last week you may have remembered me mentioning Rice Crumbs...well, in this post I feature them - along with Quinoa Pasta! Above you can see the Pasta I have been using! For tomorrow's dish I specifically used the Shells! This Pasta is Gluten-Free and the closest to 'real pasta' texture I have come across so far! And here we have the Rice Crumbs I was telling you about!!! 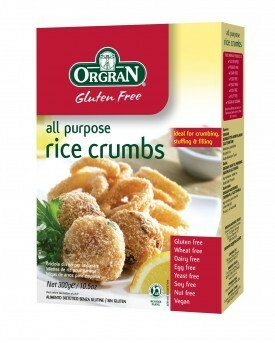 Another Gluten Free AND Vegan Product! I have to give a great big THANK YOU to my mother for finding them at Wegman's! THANKS MOM! These are pretty awesome! The texture is right-on and they are SO convenient! LOVE THESE! So here are two more Vegan Products I wanted to feature today before posting my new creation for tomorrow!